News came last Friday that British American Tobacco (LON: BATS) has offered to buy-out the remaining 57.8% of Reynolds American (NYSE: RAI) that it doesn’t already own. The deal values Reynolds stock at $56.50 per-share – of which $24.13 per-Reynolds share is proposed to come in cash and the remainder in British American Tobacco shares. Speaking as a British American shareholder I think this is a decent offer for Reynolds holders – although with the possibility that it may take an offer in the $60 a share area to see it through. Pre-announcement the shares were trading around the $47 mark – so a deal value of $56.50 represents a 20% premium. Now I do get why some Reynolds shareholders might inclined to vote no to this initial offer. Let’s face it, nobody really likes to give up high quality blue chip dividend stocks like Reynolds American unless the offer is really too good to refuse. They report high quality earnings, have an awesome track record of paying growing dividends and, crucially, $56.50 per-share is only marginally above the recent highs seen during the summer. In any case a 20% premium to the pre-announcement price doesn’t isn’t exactly setting the world on fire compared to average M&A premiums over the past ten to fifteen years. I’d add two points as to why this is a decent deal for Reynolds shareholders though. First off is the implied valuation of Reynolds stock right now. This year the company is pencilled in to earn something like $2.30 per-share, whilst forecast earnings over 2017 are around the $2.50-$2.55 per-share mark. The current offer therefore values them at around 24x this year’s earnings and 22x estimated forward 2017 earnings. For a tobacco stock that is a pretty rich multiple considering that over the past decade Reynolds American shares have averaged 14x earnings with an average dividend yield of 5.5%. Going back a little further and between the late 1990s to around 2002 that average valuation dipped to as a low as 10x earnings with a 7.9% dividend yield. The effect of that degree of chronic undervaluation on returns has been absolutely huge. An investor buying $100,000 worth of Reynolds American stock at the turn of the century would currently see their holding worth almost $675,000 assuming dividends were reinvested. That’s equivalent to average compounded annual returns of 28%. For a tobacco stock that is crazy impressive. Your current year dividend yield on cost would be in the region of 21.7% – the upshot of years of reinvesting relatively large yields. The idea that someone ploughing $100,000 into Reynolds stock just sixteen-and-a-half years ago would now be collecting $21,500 this year in dividend cash sums up better than anything why shareholders would be reluctant to give up that kind of asset. The thing is that going forward the tables are pretty much flipped. The pre-announcement P/E ratio for the stock was 20.5x forward earnings, along with a current year dividend yield of around 3.75%. If you assume a “fair” valuation multiple is the ten year average of 14x earnings – which is quite reasonable for a tobacco stock – then there’s a large probability that a current multiple of 22x earnings will work against shareholders over the short to medium term in terms of returns. Given the single major reason why the stock has performed so well was precisely because of that low historical valuation then the deal value looks quite rational. The second point revolves around the stock component of the deal. To be honest if I were a Reynolds investor I’d be more than happy owning British American Tobacco stock over the long-haul (which I do!). Assuming the deal goes through then the enlarged company will be the number one tobacco stock in terms of market-capitalization, net revenue and income. As you’d imagine for the current second largest tobacco company by market value British American already have very attractive profitability metrics. They convert somewhere in the region of 40% of their actual tangible capital into net income every year and they’ve got a very solid history dividend growth. 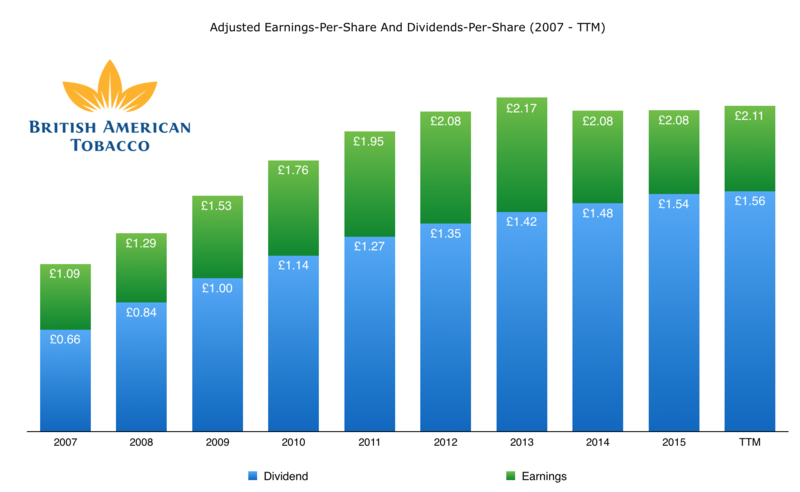 Over the past decade British American shareholders have seen their annual distribution grow by a compounded average of 10.7% a year compared to 7.3% for Reynolds American. All said and done it’s a top class blue chip dividend stock. Not only that, but if the deal goes through then you’re going to be getting something akin to the quality of Philip Morris stock with arguably a much better growth outlook as well. The other plus-point here, and one that is that is probably less appreciated, is that the shares aren’t actually all that expensive in relative terms. Granted at 18x earnings you don’t get to say that it’s undervalued like it was in the late 1990’s (when it averaged something like 10x earnings with a 7%+ dividend yield), but compared to the likes of Reynolds, Altria and Philip Morris, British American is the most attractively valued of the big tobacco stocks right now. So in other words Reynolds stockholders will see their overvalued shares exchanged for more reasonably valued British American Tobacco shares. Over the long-term that’s probably an added tailwind to the deal from the perspective of Reynolds shareholders. On the flip-side of the deal British American Tobacco holders get to further consolidate the market in North America. Considering the company already owns 42.2% of Reynolds I’d wager the board can identify some major cost controls, as well as some other synergies, in order to boost profitability and earnings since they’ll already be very familiar with the company’s operations. Indeed the company expect the acquisition to be earnings accretive in year one. All-in-all it’s a good deal for both parties – and if the value does end up getting bumped to the $60-$65 per-share range to secure the backing of Reynolds stockholders then I’d consider that a very good result for them over the long-run.